Japanese Episode AG 072: "Taggu Batoru! Satoshi VS Haruka!?" 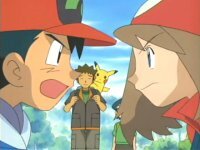 American Episode 344: "The Bicker the Better"
Satoshi is anxious to go on to the town housing the next Gym Leader, but he becomes annoyed when Haruka seems to be taking her time. The two begin an argument about how she's always holding them up, and this quarrel continues as they reach a pair of trainers, Oscar and Andrew. The two Nido-family trainers are deeply in love, and they request a tag battle from Satoshi and Haruka. They agree, so Satoshi sends out his Heigani while Haurka sends out her Eneko. Eneko's Assist attack inadvertently freezes Heigani, costing them the battle and fueling Satoshi's annoyance with Haruka even more. The Nidoqueen and Nidoking trainers leave and later meet with Musashi and Kojirou, asking them for a tag battle as well. The Rocket duo manages to lose even quicker than Satoshi and Haruka did, causing a fight to break out between Musashi and Kojirou. Later, the Rocket-Dan meets up with Satoshi and his friends. Since everyone is still sour after their recent loss, they all agree to participate in a tag battle, with Satoshi and Kojirou pairing off against Musashi and Haruka. The tag battle goes smoothly enough until Musashi calls on her Dokukeiru, disrupting the two-on-two battle. Chaos ensues, and the Rocket-Dan take advantage of this to kidnap Pikachu. 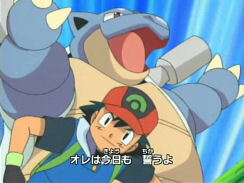 Satoshi and Haruka are able to put aside their differences to unite and send the Rocket-Dan packing, and the two trainers apologize for being so upset with each other. This is your typical humorous Houen filler episode, and I for one loved it. It's understandable that, after traveling around together for a while, that two people would get sick of one another. These neat little "slice of life" episode really makes these characters seem that much more real, and it's episodes like this that really make me love Advanced Generation. I'm also amused by Oscar and Andrew (I don't know why they decided to give her a man's name) simply because of how over-the-top they are. These characters seem like they came straight out of Kanto, and I hope they appear again to entertain us even more. They sound like Norman and Caroline to me in the dub, but I'm hardly an expert when it comes to picking out voice actors, so I could very well be mistaken. The animation error in the original version of the opening theme, The Challenger! !, has been corrected as of this episode. The image on the left is from the opening sequence as seen in Episodes AG 070 and 071. The image on the right is from the opening sequence as seen during the rest of the time it's used. Nidoking and Nidoqueen keep their Japanese voices. Four seconds are trimmed from the opening shot of the episode. This episode has the Trainer's Choice where they mispell Onix's name as "Onyx." We know that 4Kids knows how to spell the pokemon's name (i.e. "The Crytsal Onix"), which makes the pokemon's mispelling here extremely odd. I don't know if the mistake is a case of the company being spread out too thin or if it's just flat-out stupidity, but it's a funny mistake nonetheless. Two seconds are cut from the beginning of the scene after the Trainer's Choice commercial break. This isn't the first time a bii-da shot has been cut, but it's still weird that they would have a problem with it now when they used to allow this sort of thing back in the days of Kanto. The TO BE CONTINUED... screen is shortened by three seconds.